FlyingFiber’s 10G SFP+ is a series of optical transceiver modules operating at 850nm, 1310nm, and 1550nm wavelengths on Multi-Mode Fiber (MMF) or Single Mode Fiber (SMF). 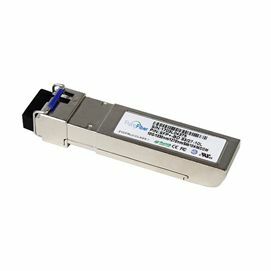 They are designed for use in 10-Gigabit Ethernet, 10G Fibre Channel, SONET/SDH OC-192/STM-64, and OTN OTU2e links, compliant with the SFP+ MSA. Digital diagnostics functions are available. The optical transceivers are RoHS compliant.